There’s definition of health that I love that health is just “the absence of the worry of your body”. So if health is essentially not worrying about your body, then maybe wealth’s definition is “not worrying about money” or “having a life where you do not worry about money”. Why on earth would you get up at 5 o’clock in the morning, when it’s freezing cold outside, to go for a run? You won’t. Unless you create a strong vision that’s deeply embedded in your brain neurophysiology through daily visioning and affirmation. So that’s Step 1. You can also read our blog post on The first step to wealth or watch our video on this. And remember to ensure you have the three elements of your visioning taken care of: Detailed words; vivid pictures; deep emotions. Step 2: is to reduce the energy you need to do what you need in order to be wealthy by creating habits. As Stephen Covey in 7 Habits of Highly Effective People discusses, most of the space shuttle’s energy comes from the first small part of its journey as it leaves the earth’s atmosphere. Thereafter, it’s low energy. So create your wealth habits. Step 3: Identify your One Thing that you need to do in order to generate the most bang for your energy. Whether it’s a specific expense saving action or something to increase your revenue, make sure that you pick just one to start working on, and focus everything you have on doing it consistently. Watch our video here or read the blog post on this. Step 4: No excuses. Turn off the TV and social media, and create the time you need to earn extra income. 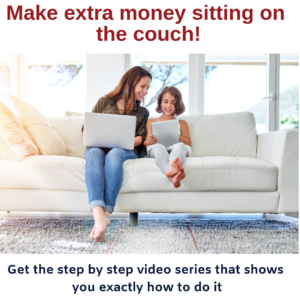 Read our blog post on the 6 ways to make money while sitting on the couch or watch our video here. Put aside 1 hour a day and earn $900 per month. Hello everybody. It’s great to have you here on Working Women’s Wealth. Today we’re going to discuss how you even begin to start on creating wealth for yourselfNow, for many of us, we can’t even make ends meet, let alone thinking about creating wealth. So I think the first place that we’ve got to start is what is the definition of wealth. Now, there’s definition of health that I love that health is just “the absence of the worry of your body”. Let’s think about that for a little while. Let’s think about what life would be like if there were absolutely no aches and pains; if there were absolutely no headaches; no stomach issues; nor any form of health issues; no weight issues. That you’re never worried about your body, that if you felt like a piece of chocolate, you ate a piece of chocolate. And if you felt like that ice cream, you ate it. And when you didn’t feel like it, it didn’t bother you at all. Where you listen to the needs of your body without it being a conscious mindful exercise. So if health is essentially not worrying about your body, then maybe wealth’s definition is “not worrying about money” or “having a life where you do not worry about money”. You don’t spend money just because you want to spend money, like eating chocolate just because you want to eat chocolate. You spend it because you need something, not want something. Where you don’t worry about whether you have enough money saved for retirement, when every single move that you make doesn’t worry you that you might run out of money because you’re using too much petrol and it costs you much, or the daily living expenses are rising every single year with inflation. Let’s take that that definition of wealth is “not worrying about money”. How do we get from where we currently are, to that state of utopia? And it’s the same question that many of us ask about our health. How do we get from where we are currently, to a place where our body is fit, and strong, and we don’t spend half the day thinking about how we would love that Coke or ice cream? My hypothesis, or where I believe that we should start, is with what my dad would say, “getting your mind right”. And really what that’s saying is that I believe it’s impossible to change your health or wealth, without having a good enough reason in your head. Let’s take, for example, the situation that you’re sitting on a couch, watching TV, munching on your ice cream. Why on earth would you get up at 5 o’clock in the morning, when it’s freezing cold outside, to go for a run? Because you know what? Really, actually sitting on a couch eating ice cream is a hang of a lot more fun, and I’m quite fine with it really. So, the only way that one is ever going to let go of that yummy bowl of Dulce de Leche ice cream, is to actually get your head into a space that you can make that effort, to change your behavior. And I really love Stephen Covey’s view on changing habits and changing the way you are, which he likens it to when the space shuttle takes off. Almost all of its energy is used getting through the atmosphere, the barrier near earth, until they can get out into space. And that’s the same. Once you seem to cross a certain threshold, health or wealth do become an automatic type of behaviour. But like anything, it takes a lot of effort and energy to actually get yourself into the space of developing habits that change your way of life. For me personally, I guess one has a choice. Do you resign yourself to the fact that you are always going to be fat, and unfit, and sitting on a couch eating ice cream? Or similarly, do you resign yourself to the fact that you’re actually never going to have any money? Is that actually a possible solution? I learned this from a man called Lou Tice, who founded an institute called The Pacific Institute. And basically, one of their fundamental beliefs is that if you hold a strong enough vision, and you affirm it enough, that that vision can become your reality. So, for anybody who is going through a tough period of time setting up a business, or getting something ready for a presentation to a board – we have a very strong vision of what we want to achieve. So we’re able to go through all of the pain, and discipline, and hard work it takes to get that presentation ready for the board, because in your mind you have created a strong enough vision. You’ve assessed who your audience is – so in your mind you picture a table with each of the members of the board at it. And then you picture the flow of your presentation, and you picture what objections they may have. So you go through an enormous amount of work for this board presentation, but what it’s basically based on is a really strong set of mental images or pictures, as to what it’s going to be like. 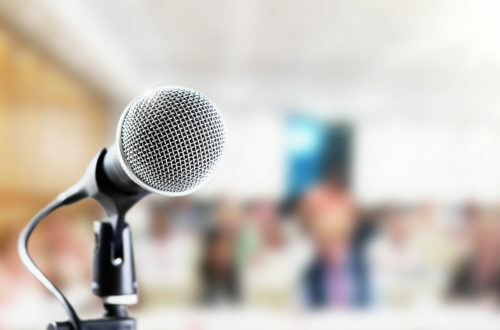 There are a lot of words that you write down in order to understand what your response is going to be through your Power Point presentation, or the pack that you submit to the board, and you’ve gone through the emotions of picturing yourself not so nervous that you actually are going to start and not be able to say a word. And exactly like that, it takes weeks and maybe months of preparation, to get this presentation ready for the board, or for your investors. Those months of preparation, and hard work, and late nights – you get through them because you have a strong enough vision. And health and wealth are exactly the same. None of us are going to stop spending on things we want until we have a clear vision of how we see the future. And that clear vision is something that I tell my clients that they should sit down and write through it in great detail. When any of my new clients start with me, I give them a Moleskine book. And in that book is a set of questions, and it starts with: If you had absolutely no money restrictions in the world, what would you do? What does a year look like, what does a month look like, and what does a week look like? And explain it in deep, deep, deep detail. Where are you? How are you feeling? What are you doing? Who’s with you? Who are you talking to? And that then we bring it back and we say, okay, so that’s in a completely unrestricted world. What does your retirement look like? Where do you see your retirement? How do you see yourself getting through each of your days? Do you wake up and go for a run in the morning? Is there some work that you’re doing, because actually you don’t see it as work. You would love to teach kids how to paint when you’re retired, because although you’re in a corporate job, your passion in life is teaching kids how to paint. So a part of what you need to do is to create a really strong vision of what you want your life to be. And the reason why we do this strong vision, is that we want to make sure that we are able to translate that vision into a snapshot picture in your head, and summarize it down into a few sentences that are filled with present tense words that articulate how this life is going to work for you. When it comes to health, it’s a very similar thing. One of the affirmations that I have for health, and it came after summarizing three different pages of writing, is that “I love my strong, lean, Demi Moore body, that brings me great energy and passion”. And that highlights the couple of things that we need to have in place. The first thing it has to be in present tense, the second thing is that it’s got to have a picture that is associated with it. And if you read on my blog, the picture for me of Demi Moore is not Demi Moore at the Oscars or any of that stuff. It’s her doing a one-armed push-up in G.I. Jane. And for me, that represents the strength and health that I would love to be able to achieve. You know, looking like a ramp model is nowhere near my expectations of health. In fact, it comes nowhere near my definition of it. What I would like to be able to do is be strong enough to keep up with my kids, that when we go on holiday like we did last year, and my daughter says, “Mom, let’s go horse riding in the mountains,” I can jump on to that horse, and gallop. We didn’t canter, we didn’t trot. That horse knew its pathway and it knew that now was the time that we gallop. And we galloped across the mountainside, at a pace that I have never done in my life, let alone it having been years since I last rode! But if you are strong and fit, you’re able to take on those unexpected physical challenges that young kids bring. And I want that health, so that I can have energy, so that the passion that I have for my work can be translated into the energy that I need in order to do my work, keep up with my kids, and live the retirement that John and I have a clear vision of. We would love, in La-la Land, our retirement to be a global retirement. And the reason why is that we have three girls, and those three girls are going to be global children. They already are global children, because John and his family come from England, so we spend our time and our holidays in different places. If they’re global children, they’re more likely to go and study overseas, and to live overseas. So we would like the ability to be healthy enough, and have enough wealth to be able to support this. It’s still a long journey and we’ve got a long way to go, but we have a very clear view of what we want to achieve. So the first step to understanding where to start, is to have a strong enough view of where you want to end up. And the reason for that is because like health, wealth is not a decision you suddenly come to. You don’t wake up one day and go, “I decided to be overweight and unfit.” It’s accumulation of days, and weeks, and months, and years, of not waking up early and going for a run, and not eating healthily, and not having enough vegetables, and looking after your gut health. That’s what makes you, today, unfit, unhealthy. It’s not a single decision. It’s this long journey of tiny little daily decisions. Those daily decisions all accumulate. That state of mind, that lack of a strong vision of how you want your retirement to be, they all accumulate to result in not having enough money to retire, or for the goal that you want to do, or to send your kids to university, etc. And I don’t know how many times I can tell you that people say to me, “But the $10 here, the R500 around there, the £16 somewhere else, they don’t matter.” They all matter. It’s exactly like saying, “Well, it’s just a little bit of chocolate every single day, or a little ice cream every day. What does it matter?” It’s only a few calories, but it matters. I just didn’t quite wake up in the morning. It all matters. So if you have a strong enough vision, and you recognize, secondly, that wealth is a daily decision, then you’ll be in a much stronger position to be able to start taking the steps, because when you’re saying no to buying that third dress, or even the new dress for the new season, just one of them. When you’re saying no you’re saying no to that because you have a clear vision of what you want. When I started this business of my own – building my own wealth management practice, I had a very clear vision of what I want to achieve. I want to help people understand their money better. I want to give them great advice. So there were many decisions I had to make in terms of cutting my wealth and cutting my income, because I wanted to be able to stop earning a large corporate salary, and give that up to be able to start my business. And I giggle with my friends because right now I earn less money than the lady who comes in and helps us with our ironing. But for me, it’s just a temporary space that I’m in, in order to fulfill this great vision that I have for my business and my company. Those visions mean that the sacrifices we make now, I make happily. I would love to be in a position to drive a big car, and not worry about things like that, but I’m not. But I absolutely don’t mind one tiny little bit, to drive my tiny little Honda Jazz, because I know that that money that I save not only on the car, but also on the maintenance, and on the petrol, enables me to be able to cut my expenses so much that we can halve our income and still be able to survive and live a decent life. So it all comes down to having a strong vision. That means that those everyday sacrifices don’t actually feel so hard. Step number one, write down your visualization of your retirement, or your particular financial goal. And then lastly, you need to refine it, and refine it, and refine it into one or two sentences that vividly encapsulate the goal you want to have. And each day, just repeat that affirmation. Build that vision into your neural pathways. It’s been proven scientifically that you can create through deep emotion, and deep picturing, and deep visioning, that you can create that as a reality that feels like it is your present tense. It helps you to make the decisions as if this business is yours, or this financial goal is yours, or this retirement is yours. The second step to wealth that you need to take is to know that, like health, this wealth thing is a daily habit. And it requires you to be exceptionally mindful of every single moment, that you don’t just act subconsciously. There are many daily habits that each of us have, that do actually change the way that your wealth turns out. You might go every single day to the cappuccino shop three times a day, because actually it’s a procrastination technique and a decompressing from a really hard day at work. And your office has a canteen at the bottom of the escalator and that moment of getting up from your desk, getting a few mates, going down the escalator, and landing up in the cappuccino shop is a break. Paying for another drink that when you’re having three a day, or two a day, every single day, 23 workdays in a month, it all adds up. But it’s such a subconscious thing that we’re not actually mindful of how much money we’re spending. So like health, wealth requires us to be quite mindful of the behaviors that we have. One of the things in The Millionaire Next Door (it’s a book I love) says that you have a one in 4,000 chance of getting rich quick, but you have a three in 100 chance of doing it the good old fashioned way, through hard daily work. So it means you’re 120 times more likely to be wealthy if you build these daily habits of mindfulness and managing your money. But you know what? A bit like health, you can’t tackle everything all at one time. You’ve got to first get your head into the space of actually thinking about being more deliberate in your decision making, and more mindful in your daily expenditure. But then you need to spend some time and look at (either from cutting expenses, or generating more income) what is the one thing that I need to do? Don’t try and focus on everything. Don’t try and save for retirement, and kill your debt, and pay off your home loan, and stop using your credit card. Just take it one step at a time. There’s a book called One Thing, and the author shows that actually you are more likely to succeed if you focus on one thing and not three. So whatever that thing is, just go through it systematically. 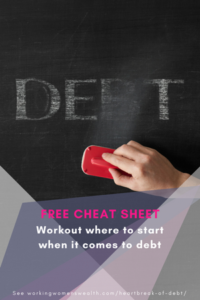 And we have a download on our website, workingwomenswealth.com, that helps you work out what is that one thing, either in generating more income, or cutting your expenses, that you need to do. Once you have identified that one thing … and I did this exercise with one of my clients. And her one thing was that she needed to generate more income. She wasn’t having those extra cappuccinos. She wasn’t in debt, but she wasn’t able to make ends meet. And each month, there was this huge struggle in the fourth week of the month. It was a bit like Groundhog Day, because it just starts every single month, and every single months you think, “Goodness gracious me. Here we go again. Money comes in, salary comes in, bills go out, and by week three there’s nothing left.” And you’re trying to squish through the rest of the week. Her thing was generating more income. And when you look at it, this generating more income thing, many people say, “But I work eight to five, nine to five,” whatever it is. “I’ve got a full day job. I come home, I look after my kids. And after looking after my kids, I then put them to bed and collapse on the couch, or have dinner with my husband, or something, and I go to bed exhausted.” And I know this sounds quite, maybe tough, but the thing I would challenge you with is just to say your vision is not strong enough. Because it’s an amazing thing about having a really strong, clear goal, that working towards that goal actually generates energy, and generates sense of the gap between where you currently are and where that goal is. And in that gap, comes that energy to try and narrow the gap, because there’s this dissonance in your brain between this vision of the strong lean Demi Moore body, and the gap of knowing that currently I can’t quite get there on that one-arm push-up. So your body creates the energy and creates the willpower to be able to generate activity that will move you closer to that goal. When I was over 40, and had three year old twins and an eight year old little girl, my vision was so strong that I signed up to go and do a degree on financial planning. And everyone looked at me as if was nuts. Doing a graduate, or honors degree with a whole bunch of 21 year olds in the evenings, working in the evenings for lectures, and then full-time work every single morning, every Saturday, every single night that one can do, on the assignments, and exams, and tests. I ended up being able to pass, and not just pass but do well at this degree, for no other reason besides my vision for the freedom it would create for me personally if I was able to land this wealth management business. I would then be able to leave corporate, and not have my life determined by other people in businesses, and have the flexibility to watch my little girls swim in their galas, play their netball and do whatever it takes to be a mom, a present mom, but within the context of a full day working mom in my new business. And that vision was so strong, that even when I was at the point of collapse, which usually came after every single exam period, I was able to know deep in my heart that whilst I was exhausted, and whilst I missed my friends, because I had to sacrifice time with friends, those hours of waking up at four in the morning, those Saturdays of working, those Saturday nights when everyone else was out, were worth it. That’s why I say, if you are needing to generate more income, you have to have a really strong vision of the benefits of being in a position where you’re not stressing about wealth, where you have that little house fully paid off, or whatever it is that your goal is. I did an article actually on six ways to generate income spending one hour a day sitting on your couch. And I worked out that you could create $900 a month by just doing this. And I took six very, very different ways for different humans. There’s a creative way in generating graphical designs for people’s blogs and podcasts,. There is a way that you can earn money by uploading your smartphone pictures onto a smartphone repository, and when someone buys your smartphone picture, you get paid $5. You can review apps, you can be a proofreader for people’s blog posts, books, whatever it is. You can fill in questionnaires for market research. You can sell your stuff online at Etsy. There are various different ways, depending on what your unique talents are, that whilst you’re sitting on your couch, you can build a business, or you can generate more revenue. And it just takes having that picture, to be strong enough, than the television, or than the alarm clock, in order to work out how you can generate more wealth. In recapping, find one thing, just one thing that you’re able to do, that you know will generate either the most income, or save the most expenditure. And set your goal to do that. And once you feel that you’ve taken the energy of the spaceship to get through the atmosphere of changing your behavior, then take on another form of commitment in terms of generating your wealth. Going back to the beginning, how do I start saving money? Or how do I even start in this journey of wealth? My answer, first of all, create a really strong vision in your mind of why you’re doing this. Make a vision that is big in pictures, long on words, and deep on emotion. And summarize that with one snapshot picture in your head, that you can recall quickly, and even make a drawing of it, or a vision board of it, and put it on your mirror, that gives you a reminder every single day of what you’re doing this for. So number one, create a strong vision, reduce it down to an affirmation of two or three sentences, and repeat that every single day. The second thing, be mindful of your day. Where are you spending the money? What are you doing with your time? If you say that you can’t create time, how much time are you spending on social media? How much time are you spending on watching TV? So be mindful of where you spend your money and your time, because those are the bases of wealth, saving money and having the time to create more money. Number three, look at all of the things that you can do, and create a daily habit that takes one, just one item, and enables that one item, whether it be generating more income, or not having cappuccinos, or canceling your holiday, or some other thing, to create that lift that you need in terms of generating wealth. And that’s how you begin to make your wealth. For all of you, I hope that I will have you again on the show. Please do subscribe to this podcast, because what will happen is that it will automatically download the next in the series.